Stage two: Occurs after the first truly awful and truly wonderful long runs have happened. It can take you from feeling like you’re worthless to feeling like you’ve conquered the world. Either way, you’re even more determined to finish the damn thing. Even though it is still months away. Stage three: OMG other people ran a great marathon today and I’m scared and OH she ran a fast race–I thought I was faster than her–well HELL, now I’m SCREWED. I JUST WANT IT TO BE OVER! Stage four: It’s me. The road. My legs. Don’t I actually kind of love to run? Isn’t that how I got myself into this? Yes, that’s why. That BQ I want? Would just be icing on the cake. You get to run 26.2 miles this weekend, headcase. Make it count. running the streets of Philly, 6 months to the day before Saturday's race in Fargo. I’ve just made the leap to stage four. I hope the race goes well! The taper is evil. It has your brain thinking all kinds of crazy things. Sooooooo true. We are truly blessed to be able to run 26.2 miles, no matter how fast, slow, and barf induced they may be (but won’t be this time, obvs). Funny, and so true! 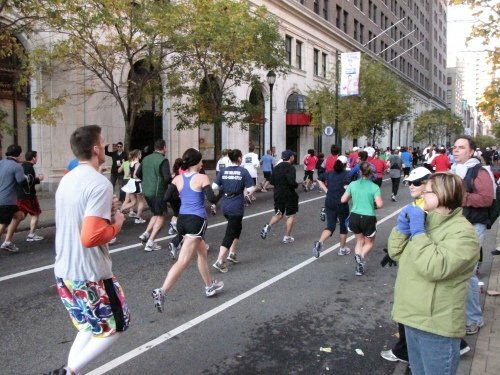 I like seeing the marathon as the victory lap for your months of hard work (because it’s much harder to run a 20-miler alone when you have to stop in a church many miles from your home to use the restroom and there’s no one but you to make you keep going rather than hailing a cab home). Enjoy it! Yeah, that’s the next step they have some nice widgets to use, and I think I’ll set up an ernite page dedicated to recent comments, which might be nice. I’ve always wanted a place to list like the last 50 comments, and WordPress didn’t make that easy to do AT ALL. Once you’ve the images and music, you may need to put the two together. try to sell video that demonstrate hacking of Facebook. If it is steady, either the player is in vacation mode, or he is building army for a battle and he has ceased production of valuables.